John E. Harmon, Sr. IOM, has served as the Founder, President, and CEO of the African American Chamber of Commerce of New Jersey, since 2007. Harmon is the former President and CEO of the Metropolitan Trenton African American Chamber of Commerce (MTAACC). Under his guidance, MTAACC grew its membership substantially, forged alliances with business associations/organizations and government, and forged strategic partnerships in the public and private sectors to benefit African American businesses throughout New Jersey. 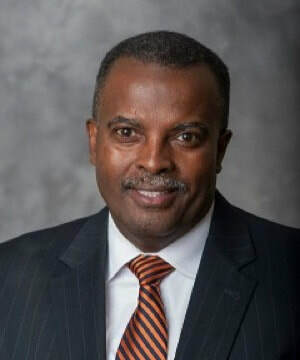 John Harmon also is the Former Chairman of the Board for the National Black Chamber of Commerce; there are 150 Affiliate Chapters of the NBCC and over fifteen international affiliates. He is the Founder and Chairman of the New York State Black Chamber of Commerce (NYSBCC). Additionally, Mr. Harmon is a Board member of the New Jersey Chamber of Commerce (NJCC), New Jersey BPU, Supplier Diversity Development Council (SDDC), Opportunity New Jersey, Better Choices Better Care NJ, Chairman of Crime Stoppers of Greater Trenton and a former Board Member of the American Chamber of Commerce Executives (ACCE), First Book, Minding Our Business (MOB), a youth entrepreneurial initiative in affiliation with Rider University. Lastly, he is a member of The US Chamber of Commerce Committee of 100, Harmon was recently acknowledged in South Jersey Journal’s inaugural list of the “Twenty-five Most Influential African Americans in New Jersey”, for the second consecutive year. Harmon was selected for Return on Information-New Jersey (ROI-NJ) “2018 Power List of Influencers. Harmon is also recognized as a Center of Influence (COI) for the United States Army and was recently selected as a participant in the Joint Civilian Orientation Conference (JCOC) hosted by the Secretary of Defense. The JCOC program is the oldest and most prestigious public liaison program in the Department of Defense. Harmon was selected as one of 40 individuals (out of 230 applicants) to attend JCOC18. In addition, Harmon is the only attendee from the State of New Jersey. Harmon was the first individual selected as a member of the host committee for NFL Super Bowl XLVII held in New Jersey 2014. Mr. Harmon holds an Associate’s Degree in Business Administration from Mercer County Community College and Burlington County College, and holds a Bachelor&#39;s Degree in Business Management, Fairleigh Dickinson University, 1983. Mr. Harmon also successfully completed a one-year Fellowship on Regionalism and Sustainability sponsored by The Ford Foundation and completed the Minority Business Management Seminar at the University of Wisconsin-Madison, in 2009. Additionally, Mr. Harmon completed a four year Chamber Executive Management Program, at Villanova University, sponsored by the U.S. Chamber of Commerce, in 2014. Prior to his twenty year career as a chamber executive, Mr. Harmon was previously employed at The Bowery Savings Bank in New York City where he managed the bank&#39;s Residential Real Estate Department overlooking major mortgage loan transactions; and at Chemical Bank where he managed third-party loan originations for New York, New Jersey and Connecticut. While working at Chemical Bank, Mr. Harmon established The Affordable Housing Loan Program. Following his banking career, Mr. Harmon founded a transportation company in 1989, called Harmon Transfer, Corp. The company transported foodstuff, perishable commodities, and products throughout the Northeast United States and Canada. Mr. Harmon has three sons, John Jr., Joshua, and Justin.